First, let's set one thing straight. Mushrooms are not actually plants, but fungi. Fungi eat, or break down dead plants for fuel. Standard mushrooms can easily be identified by the dome or cap shape protruding from the stem. If you look under this smooth dome, you'll see thin gills. Those gills produce the mushroom's spores. Mature mushrooms proliferate in a similar fashion to plants, producing tiny spores that act as seeds and allow for the fungi to spread and grow. This is one of the easiest ways to grow mushrooms at home. It's also a cool food science project that will require very little active time and is something you can do while you make breakfast and the morning cup of coffee. Simultaneously you are creating a high value compostable material from which the residual caffeine, a mildly toxic herbicide, is largely degraded by the fungus. 20% coffee grounds and 0.5 kg of spawn (we suggest starting with Oyster Mushrooms.) to produce about 1.25 kg of mushrooms. Spent cardboard or paper products without glossy inks. Container or bucket with lose fitting lid. A warm and dark place to store your bag/container. Freshly brewed coffee grounds from a coffee maker or french press are effectively pasteurized by the brewing process so once it has cooled below -100F you can inoculate it directly with purchased grain/sawdust spawn or cuttings from fresh mushrooms. Cardboard or paper products can be shredded and boiled in water and once excess water is drained or pressed out this too can be inoculated with spawn or cuttings. It is best to start with a small amount of both growing media (coffee/paper) and some inoculum (spawn/cuttings). The mycelium is very often visible at the base of mushrooms and will readily "jump off" and begin to "run" into a new food source within its reach. Place these cuttings in direct contact with the cardboard to provide as many jumping off points as possible. Once you've got a half a five gallon bucket or so of colonized cardboard you can turn around and use this cardboard as spawn to inoculate a second bucket started with a few layers of new cardboard, some cardboard spawn, a fresh but cool coffee filters/well drained grounds, more spawn and another couple layers of new cardboard. About three weeks later you should see some mycelium establish itself and the mixture should start to turn completely white. From here on out as you generate coffee waste you can add it to the top layer, add some fresh spawn from the first bucket, and add a little more new cardboard to seal in moisture above the spawn. Repeat until bucket is filled. Once your mix is completely white move your growing container over to a spot with plenty of fresh air and a little light – a shaded windowsill or countertop is ideal. Drill 1/2'' holes near the top of the bucket for ventilation. Check every couple days to see if the top layer is drying out. If so you can mist it with de-chlorinated, or off-gassed tap water. About a week later you should start to see tiny little mushrooms bursting into life. Over the following 5-7 days they should double in size every day. It's time to harvest when the edges of the caps begin to turn upwards. Remove mushrooms by cutting at the base of the stems. White mycelium running up onto un-colonized cardboard. Thanks to amateur mycologist and educator Martin Gordon for your contributions to this post! We reconnected with the Tiny Diner Farm and had a chance to speak with Martin Gordon, Mushroom Cultivator and Project Lead, about the farm's cultivation plans and all things fungal-related. Read on to learn about the multiple benefits that mushrooms provide, the history of the Farmhouse, the farm's plans for building out an indoor mushroom incubator in the near future and tips and resources for growing your own mushrooms. How did you initially connect with the Tiny Diner Farm? Two years ago I think I either got an email or saw a posting for a job at the Tiny Diner Farm in the social media sphere. I wasn’t doing much at the time so I decided to apply. I met with their farm manager Koby Jeschkeit-Hagen at a nice cafe in the Longfellow neighborhood of Minneapolis and chatted with her about the vision for the urban farm space and the model that she and others had come up with for the Tiny Diner Restaurant's urban farm-to-table model. It sounded like a cool learning opportunity as well as a good intro to the idea of permaculture, which at the time I had little to no concept of. It was intriguing to me to put farming into an ecological context - not doing monocultures and other simple concepts that a lot of people seem to be picking up on now. I also hadn't delved much into the farming for restaurants model, which is an interesting idea. You see that happening in some cities in Europe and it seems to be pretty successful so I thought I'd see what that world looked like, and could look like, in Minneapolis. How did you decide to start growing mushrooms? Last summer (at the Tiny Diner Restaurant) we were asked to select a ‘niche’ role to explore and implement at the urban farm site that was novel and would help us accomplish something tangible. I remember having a conversation with a couple of my friends there and we talked about ways to make a bigger impact on local food. Something substantial, something hearty, something that could be easily mixed into the fold. We talked about how we could grow things that perhaps weren't represented well elsewhere. From there we came up with the idea to try out small scale mushroom cultivation. I ended up being the individual who oversees the project but everyone at the Tiny Diner Farm helps out where and when they can. 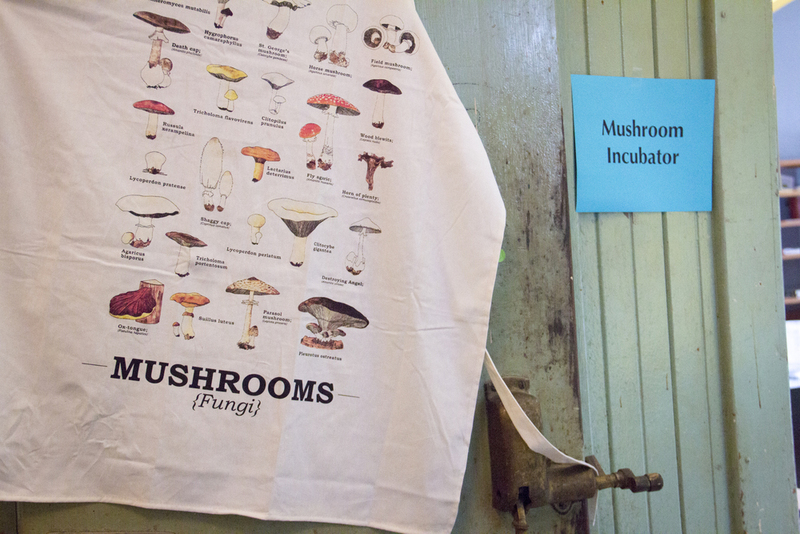 The Farmhouse's indoor mushroom incubator welcomes guests with an apron depicting different mushroom types. Why mushrooms? What got you excited about them? I think, predominately, it was that I didn't know much about them. Fungi seemed like an interesting field and something that I didn't really see the local food scene doing too much of. It seemed like something we could do pretty easily here. There are really low-tech, low investment ways to cultivate fungi. Subsistence farmers in low and medium income countries, predominantly in West Africa and parts of Asia, have been growing fungi in order to pull themselves above the poverty line - through the integration of fungal cultivation on their pre-existing farms. Also, in the Midwest, it's theoretically something you can grow year-round. It seems like a good way for farmers to be able to continue producing food outside of our short farming season here and a way to supplement year-round income. The interesting thing about fungal cultivation is that you can generally use a lot of “waste” products to do it like coffee grounds, cardboard and straw. Basically, any carbon-based agricultural waste can be used as a suitable growing medium (for species like oyster mushrooms). Also, similar to many older urban sites, we’re dealing with toxic legacies like soil pollution. Oyster mushrooms are the quintessential species known for breaking down toxic waste. If we're able to identify a space on the Tiny Diner Farm site that has pollutants in it we could utilize fungi to remediate the soil. We've heard mushrooms are multi-functional and can provide multiple benefits to society. Can you describe these functions? There are three main ways that mushrooms can benefit society: as food, as medicine and as a mycoremediation tool (a form of bioremediation or the ability of fungi to degrade or sequester contaminants contained in soil). In the food arena, mushrooms can be cultivated in relatively small spaces, making them ideal for urban areas. They also provide a rich source of nutritious protein; there's more protein in oyster mushrooms than in chicken. In terms of medicinal benefits, fungi have a lot of really novel anti-viral, anti-microbial, anti-cancer compounds specific to their kingdom. Traditional Western medicine hasn't explored this aspect of fungi in a lot of depth yet, but there's great opportunities there for deriving useful medicines. In terms of bio-remediation, mushrooms can break down a lot of petroleum based contaminants. Fungal remediation disassembles carbon chains that are toxic into their benign building blocks (carbon and hydrogen). Fungi are incredibly adaptive! How did the mushroom production process begin at the Tiny Diner Farm? Last year we conducted a couple of trial mushroom phases outside on the north side of the Farmhouse building. We stacked 5 gallon buckets filled with growing medium two tall in the raspberry patch, which allowed for the right amount of humidity needed to fruit the mushrooms. We produced around 50-60 pounds of oyster mushrooms from roughly ten buckets, which is pretty good considering you can’t control the growing conditions as well in an outside setting. Once our indoor mushroom incubator is up and running we'd initially like to try and produce around 50 pounds of mushrooms a month and scale up from there. Ideally, at the Tiny Diner Farm we’ll also be finding a local source of fungal growing media. Then, once we’ve grown and harvested the mushrooms, we can reuse the spent fungal substrate (straw) to regrow other mushroom varieties. It can also be repurposed as mulch or as animal feed because it’s quite a bit more nutritious once it’s been myceliated (inoculated with fungal spores during the mushroom growing process). Mushrooms can be grown in a variety of setups. Seen here - oyster mushrooms growing on buckets outside of the Farmhouse. Close up of oyster mushrooms - a hardy, versatile, resilient species. What is your favorite species of mushroom and why? I like oyster mushrooms for their abundant versatility as food, medicine and as a bioremediation tool. There is ample data that shows it as a species with a lot of credentials in all of those areas. Plus, the species can be super forgiving when trying to cultivate in non-sterile and low-tech situations. Tell us a bit about your educational background and how it has shaped you work. I have an environmental science degree from the University of Minnesota with a focus in conservation resource management. I worked as an intern at both the Cornercopia Student Organic Farm and Native American Medicine Gardens at the University's St. Paul campus and through those gained an interest in food systems. I also worked out at Garden Farme (an organic farm that utilizes permaculture and agroecology principles) this past summer which really solidified in my mind the potential positive ecological impact that farming can have. I've really enjoyed these experiences and have been doing work on growing food every season since graduating from college. Hopefully, I'll be able to get to a point where I'll be able to grow food year round. Do you come from farming roots? Do you have a grandparent or close elders who have influenced your work? None of my immediate family members are farmers. I think that my interest comes from a curiosity in the natural world instilled in me by my grandfather, a botanist and professor. I really think he set me on a trajectory towards biology, ecology, and ultimately food related issues. It seems to me that lots of people have some affinity towards living things. I think my personal interest has spilled over into fungi because relatively little is known about them, not just biologically but ecologically as well. We don’t fully understand how they work as individual species, let alone what their roles entail in the environment. However, new data is showing vital links to these larger living systems in which we exist. I like to think my environmental sciences background led me to food and farming, which lead me to fungi. Can you tell us about the origins of the Tiny Diner Farm's indoor growing space (the Farmhouse) and why it’s suitable for growing mushrooms? The space had been an old convenience store up until the mid to late 60’s when it closed down. We’re working on retrofitting the original walk-in cooler to withstand the high humidity conditions needed to fruit mushrooms and also providing enough fresh air because they generally need quite a bit. The cooler was once used to hold meat, milk and other spoilable products. We're planning to install some fresh air intakes and exhaust vents to adjust the humidity accordingly. It’s a cool fit because the space is insulated and self contained so it will retain a consistent temperature and level of humidity. The mushroom incubators' current place in a functional shared office space and community room is also a great way to showcase the idea publicly to people interested in fungal cultivation. The walk-in cooler space has the potential to grow 50-100 pounds of oyster mushrooms a month. It’s a very compact space with a potentially large impact. I think it could spark interest in people wanting to try starting small personal mushroom cultivation projects or even just beginning the conversation about why fungal cultivation matters. The Farmhouse's previous life as a convenience store circa 1931. The walk-in cooler that now serves as the mushroom incubator can be seen above in the rear right-hand side behind the counters. What is your vision for the mushroom space? My hope is to finish retrofitting the cooler, produce some mushrooms, and validate the project financially by at least paying off the costs and labor. My vision right now is to make a case study for how small scale fungal production spaces could be effectively used to bolster an urban farm’s economic model while benefiting local economies and ecosystems. There’s the possibility of having a network of smaller growers providing to local markets and hopefully making it financially as small urban and suburban production farms. The idea is to inspire farmers to produce year-round revenue from an operation that requires low investment costs and provides people with a nutritious, high protein food source from urban areas. Do you plan to grow anything else in this space? We’ve discussed growing microgreens alongside the fungi. The two would work synergistically, trading oxygen and CO2 back and forth. This is similar to what Will Allen (of Milwaukee-based Growing Power fame) and many others have done in contained indoor growing spaces. I've also experimented with growing wine cap mushrooms. The mushroom incubator today, awaiting retrofit inside the Farmhouse. What advice do you have for people interested in cultivating mushrooms at home? How should they get started? Really simply. Cloning a cutting or growing mushroom spawn on a recycled source like used coffee grounds or cardboard and paper can be done with a great degree of success. It can really help to use these processes to get familiar with how things should look and the timing of the necessary steps so you know what to expect if you move to other food sources in the future. It’s kind of like learning the steps to a dance before performing it. There is a whole wide world of possibilities in home fungal cultivation and people are coming up with new and exciting ideas all the time. Check out Tootie & Dotes' Mushrooms 101 and Mushrooms: Guide to Home Growing posts to learn more! What are your favorite mushroom growing resources? Mostly Youtube videos. You can generally find fairly sensical step-by-step tutorials on exactly what you’re looking to do as well as a number of related videos. Another good resource is finding someone who is already doing what you are interested in. Approach them and ask them what to do, spark the connection if you can. Online forums can be really good in lieu of not knowing anyone directly. Although many of them tend to focus on psychedelics, they generally have threads focusing on gourmet and medicinal mushrooms as well. There you can see conversations of what folks are doing and add your own questions. These can be pretty great resources because the forums make information from people around the globe who are cultivating mushrooms in all sorts of ways, shapes and forms incredibly accessible. The open-source nature of this information and the ability to get critiques from other growers can be a really powerful learning tool when you add in the personal experiential component. A few good online forum resources are Mycotopia and Farmhack. I think one of the best thing I could hope for would be that those people who have resonated with any of these ideas would follow up and learn more about them. Fungi are really under respected but they account for something like 25% of the living mass on our planet. Start seeing fungi! There’s a lot of potential to do some really cool work feeding people, deriving medicines and repairing a highly damaged environment. All of these are things that are not commonly being done right now, which could have definite benefits to us and our communities. Folks should consider supporting local fungi farmers who are already working here in the Twin Cities like Jeremy McAdams at Cherry Tree House Mushrooms and the folks at Mississippi Mushrooms who have an indoor production fungal grow lab. The fungal grow lab in particular is really exciting because it has the potential to grow just about any strain available en masse. That strain could be one that makes a tasty gourmet mushroom, or provides a novel antiviral compound, or helps us clean up oil spills. There’s a lot of good regionally specific work we could do with such a resource in our backyards. That’s definitely something worth supporting.